UoH PG Entrance Test Result 2017 Declared @ Uohyd.ac.in/University Of Hyderabad(UoH) PG Entrance test Results 2017 Declared @ Uohyd.ac.in: University of Hyderabad - which is also known as Hyderabad Central University has declared the list of candidates provisionally selected or waitlisted Candidates for admission to Post Graduate (PG) courses in the University of Hyderabad. The students may access their results after logging into the official website of University of Hyderabad (UoH or HCU), uohyd.ac.in. UoH has declared the entrance exam results for all the Integrated five year courses, MSc, MA, MCA, MPH and MA courses. 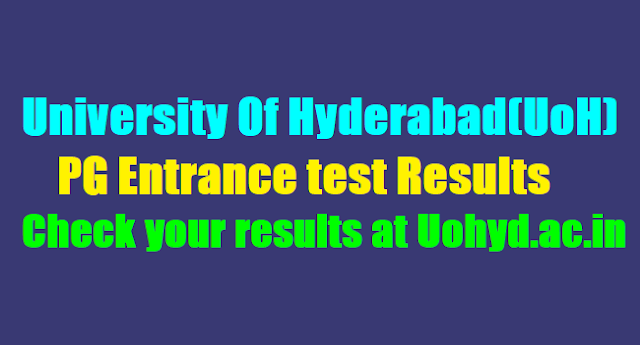 To check the results of UoH or HCU entrance results, students may logon to the official website of the university, uohyd.ac.in and then click on the the latest news. In MA courses HCU has declared the results of English, Philosophy, Hindi, Telugu, Urdu, Applied Linguistics, Comparative Literature, English Language Studies, Economics, Financial Economics, History, Political Science, Sociology and Anthropology. Uoh has also published the list of candidates who have been short listed provisionally for counseling based on their performance in the entrance examination for admission to IMSc Sciences (Mathematical Sciences / Physics/Chemical Sciences/Systems Biology/Earth Sciences), Social Sciences (EC/HS/PS/SL/AN), MSc Chemistry, MCA, MA Economics and Financial Economic for academic year 2017-2018 subject to their fulfilling the minimum qualifications for admission and other conditions given in the Prospectus for 2017-2018.